Made and signed by Navajo Indian Larry Livingston this eagle kachina doll is handmade with wood, leather and bird feathers. 9 inches x 14 inches. Shipping is free. Corn Boy Kachina handmade of wood, leather, fur and feathers and signed by Navajo artist Thompson. The Corn Boy Kachina aids in the pollenization and production of corn, a very important food. 6 inches by 3 inches wide. Gray Wolf Kachina handmade and signed by Navajo artist Largo. He is wooden with fur, leather and feathers. The Wolf Kachina is considered a great pack hunter who helps and guides the hunters on large combined hunts. After the dances the wolf is offered gifts so the tribe may learn from him and secure game on their hunt. 7 1/2 inches. 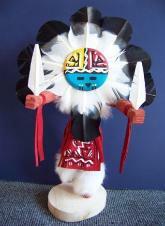 The Butterfly Kachina Dancer was made and signed by Navajo Native American artist Ina James. It is decorated with leather, feathers and fur. She wears a white fur ruff around her neck. The tabletta on her head symbolizes rain clouds. The Butterfly Kachina brings together married men and women. Butterfly Kachinas appear as a pair during the butterfly social dance. Butterfly also directs the medicine man to ingredients in flowers and other plants which can be used in medicine. 7 3/4 inches tall and 3 inches wide. Navajo Native American artist Albert Chavez made this colorful Yellow Hen Eyes Kachina Dancer. Beautifully carved and painted wood this kachina is decorated with cloth, leather, feathers and fur. 8 inches x 3 inches wide. The Laguna Corn kachina is handcrafted from wood, leather, feathers and paint. This Kachina Doll brings rain and helps to bring in a good corn crop, which was a food staple for the Hopi. Made and signed by a Navajo kachina artist, 7.25 inches tall. Shipping is Free. This handmade Wolf kachina is carved from natural aspen wood and signed by the Navajo artist, Jacida Loley. It is decorated with natural fur, leather, and feathers. 8 3/4 X 3 inches. Peacemaker kachina doll was handmade and signed by kachina artist Robert Cruz. The Peacmaker carries a peacemaker pipe and wears a real black leather hood, red wool clothing and leather moccasins, and a brown leather cape. The base is topped with small pebbles and artificial grass. 13 inches tall and 5 1/2 inches wide.